Home » Academics » Schools » College of Arts, Humanities and Social Sciences » Faculty » Meghann Peace, Ph.D.
Meghann M. Peace, Ph.D., is excited to share her love of language with students at St. Mary’s University. As a lifelong language learner, she knows the benefits that multilingualism brings, in terms of both professional opportunities and personal enrichment. She enjoys helping her students develop not just their linguistic skills, but also their multicultural understanding, in the hopes of helping them to become world citizens with a global perspective. Peace has taught Spanish at the university, high school, and middle school levels. At St. Mary’s, she teaches Spanish language and linguistics courses that include sociolinguistics, second language acquisition, and history of the language. 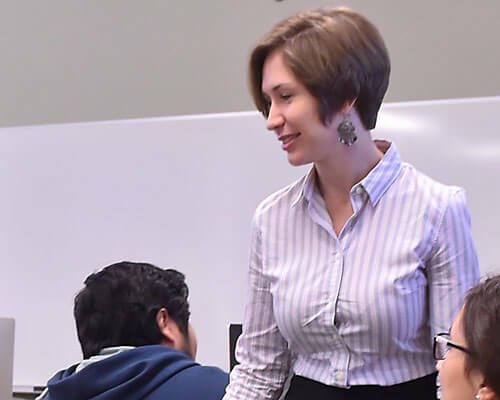 Her current research combines her interest in Spanish dialects, the globalized world, and the language, culture and identity of her Latino/a students in San Antonio. Inspired by her time leading the St. Mary’s study abroad program in Madrid, Spain, she is working on a project that studies the effects of contact between Spanish from South Texas, Spanish from Mexico and Spanish from Spain. Outside of the classroom, Peace enjoys any activities that allow her to immerse herself in multicultural and multilingual contexts – traveling the globe, volunteering as a Spanish and Portuguese interpreter at science conferences in the United States and Brazil, and studying Spanish dance and Brazilian capoeira. Peace, M. M. (2015). Other-orientation in non-native Spanish and its effects on the direct object. Foreign Language Annals, 48(4), 669-687. Peace, M. M. (2013). Adult acquisition of Spanish intonation: The effect of romantic relationships. International Journal of the Linguistic Association of the Southwest, 32(1), 11-42. Peace, M. M. (2012). ¿Lo puedo subir o puedo subirlo? : La posición del clítico en el español del oeste de Massachusetts. International Journal of the Linguistic Association of the Southwest, 31(1), 131-160. Peace, M. M. (March, 2016). Attitudes, awareness and identity: Mexican and Peninsular Spanish in contact. Presented to DiscourseNet 17, Pamplona, Spain. Peace, M. M. (May, 2015). “Poner or ponerla?”: Modeling null direct objects in non-native Spanish. Presented to the 10th International Symposium on Bilingualism, New Brunswick, NJ. Peace, M. M. (March, 2015). “Poner or ponerla?”: Modeling null direct objects in non-native Spanish. Presented to the American Association for Applied Linguistics, Toronto, Canada. Peace, M. M. (February, 2015). Case and agreement in Spanish clitic pronouns: Evidence from L2 learners. Presented to the Workshop on L2 Acquisition of Alignment Patterns in Typologically Diverse Languages: Case and Agreement, Ghent, Belgium. Peace, M. M. (September, 2014). “You’re just grabbing at big chunks of comprehension”: What do Spanish learners notice? Presented to the 43rd Annual Meeting of the Linguistic Association of the Southwest, San Diego, CA. Peace, M. M. (March, 2014). “I always want to use le when it’s a person”: Animacy, object pronouns and Spanish learners. Presented to the Georgetown University Round Table, Washington, D.C.
Peace, M. M. (October, 2013). “Is she getting it? Am I telling this in a good order?”: Non-native other-orientation. Presented to the Second Language Research Forum, Provo, UT. Peace, M. M. (October, 2013). Stimulated recalls and the complexity of learner language. Presented to the Hispanic Linguistics Symposium, Ottawa, Canada. Flaherty-Echeverría, S., & Peace, M. M. (October, 2013). (Intra)National Learning and Teaching Spanish at the University of Minnesota. Presented to the Academy of Distinguished Teachers’ Conference “Teaching and Learning in Changing Times”, Minneapolis, MN. Peace, M. M. (May, 2013). “I would love to use lo all over the place”: Teaching and Learning the Spanish Direct Object Pronoun. Presented to the Conference on Language Teacher Education, Washington, D.C.
Peace, M. M. (March, 2013). “That was the goal … for her to understand”: Spanish anaphora in L2 speech. Presented to the Workshop on Dialogue in Multilingual, Multimodal, and Multicompetent Communities of Practice, Austin, TX. Peace, M. M. (July, 2012). Yo te amo: The acquisition of intonation by native English speakers in relationships with native Spanish speakers. Presented to the American Association of Teachers of Spanish and Portuguese, San Juan, Puerto Rico. Peace, M. M. (April, 2012). Yo te amo: The acquisition of intonation by native English speakers in relationships with native Spanish speakers. Presented to the Kentucky Foreign Language Conference, Lexington, KY.
Peace, M. M. (April, 2012). El que no sabe, es como el que no ve: The grammaticalization of visto que. Presented to the Linguistic Symposium on Romance Languages, Cedar City, UT. Peace, M. M. (March, 2012). “Yo soy de Minnesota … soy de Minnesota”: English native speakers and the Spanish null pronoun. Presented to the American Association for Applied Linguistics, Boston, MA. Amaral, L., & Peace, M. M. (October, 2010). New evidence on the acquisition of the OPC in Spanish and what it means for a theory of SLA. Presented to the Hispanic Linguistics Symposium, Bloomington, IN. Peace, M. M. (September, 2009). ¿Lo puedo subir o puedo subirlo? : La posición del clítico en el español del oeste de Massachusetts. Presented to the Linguistic Association of the Southwest, Provo, UT. Peace, M. M. (April, 2009). Spanish clitic climbing: The textbooks, the classroom and the reality. Presented to the Kentucky Foreign Language Conference, Lexington, KY.